Calling all New Zealand food bloggers. This month I am honoured to be the host of Sweet New Zealand, a monthly blogging event created by kiwi food blogger Alessandra Zecchini. 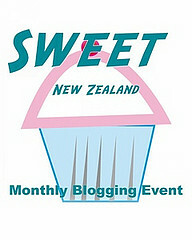 This event is a wonderful way for New Zealand food bloggers to meet and share some delicious recipes. You can check out last month’s roundup of sweet treats hosted by Nicola at Homegrown Kitchen. This event is open to all bloggers living in New Zealand (even if you are not a Kiwi), as well as all Kiwi bloggers living and blogging overseas. You can enter anything sweet: cakes, biscuits, slices, desserts, even drinks, and you may submit as many entries as you like, including old posts if you like. Your entry must contain the phrase Sweet New Zealand, the Sweet New Zealand badge (choose your own size), a link to the host, and to this post – so if you are submitting an older post remember to update it accordingly. Thank you for hosting, and have fun!